Source: 18th century manuscripts in Dresden, Berlin, Harvard University and Oxford. A Kyrie in E minor and Gloria in D. This work has been recently described (and recorded twice) under the title “Mass for three choirs”. However, this name is neither uniquely identifying nor descriptive. The Gloria is largely written for 5 voices (SSATB) with a double choir only for one movement, and occasional divisi elsewhere in the work. 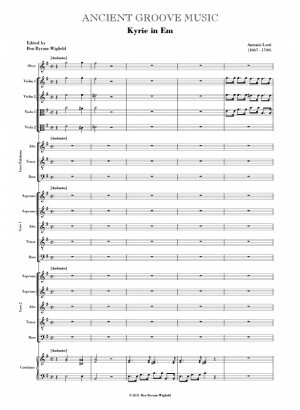 The Kyrie is in three choirs – (two choirs of SSATB and an ATB trio), but is one of seven Kyries written by Lotti with similar scoring in the polyphonic Venetian style. The work was named Missa Vide Domine laborem meum ("Behold, O Lord, my works") by Jan Dismas Zelenka, in whose collection the Dresden manuscript is found. 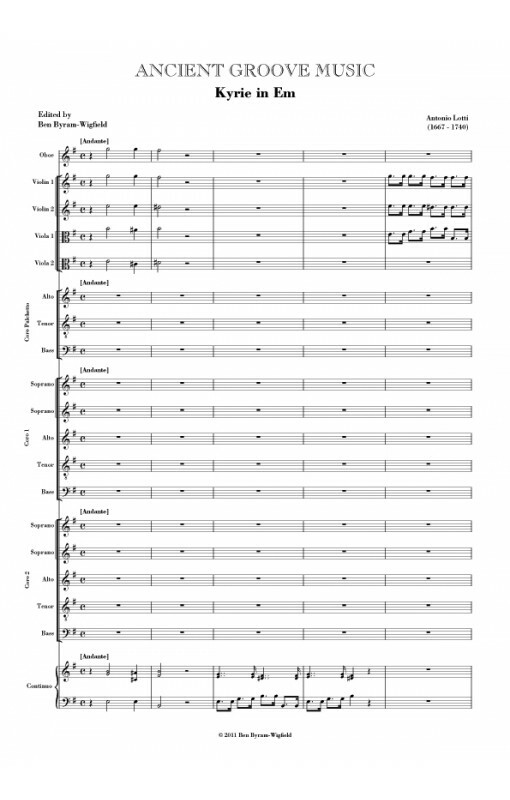 Vocal scores are available here. Samples pages are available here.